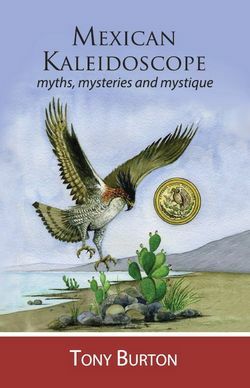 The print and ebook editions of Mexican Kaleidoscope: myths, mysteries and mystique will be published later this month. To be among the first to receive this new book, and for a chance to win your own FREE copy, please sign up below for publication updates via email. UPDATE – 22 October 2016. This draw has been won by Emily G. of Canal Fulton, Ohio – congratulations, Emily! Please note that your email will be stored securely, will not be shared with any other party, and will only be used for messages relating to the publication of Mexican Kaleidoscope. The lucky winner will be chosen at random when the print book is published and will receive a completely FREE copy of the book (format of their choosing; tax/shipping included). Depending on the number of people signing up for updates, we may offer additional prizes. In Mexican Kaleidoscope author Tony Burton delves into Mexico’s colorful history and culture. He focuses on a fascinating selection of events, discoveries, individuals and intrigues to explore some of the reasons why Mexico has become such an extraordinarily diverse and interesting nation. The 30 short chapters of Mexican Kaleidoscope span the centuries, from long before the Spanish conquest to the modern day. The topics considered range from the mysteries of Mexican food, Aztec farming and Mayan pyramids to mythical cities, aerial warfare, art, music, local sayings and the true origins of Mexico’s national symbols. Along the way, we encounter many unusual, strange, revealing and wonderful facts about Mexico. Mexican Kaleidoscope unravels some of the many forces that have helped shape Mexico’s history and culture and helps us understand the appeal and mystique of this engaging country. The text is enhanced by charming original illustrations by Ajijic artist Enrique Velázquez. This book includes an index and bibliography. An official book launch is being arranged for early December, in Ajijic, Jalisco, Mexico. Full details of the book launch will follow in due course. Watch this space! Sombrero Books welcomes comments related to any of our books or the posts published on this blog. Please email us or use the comments feature at the bottom of individual posts.